These discourses insist on a genuine open future and conceive of space as a process in which we all have our part to play. In the most broad of its various definitions, the Oxford English Dictionary describes a ‘festival’ as: “gaiety; revelry; merrymaking”. More specifically pertinent to Alice O’Grady’s paper, the OED also states that it can be “a period or program of festive activities, cultural events, or entertainment” But in either case, say you had never heard of festivals, it would be difficult to conjure up a concrete idea of what one might look like based on these statements. And you would be right. A feature on the comedic website cracked.com describes an array of real festivals taking place annually, which involve everything from swimming with enraged bulls to participants throwing mud balls filled with live ants at one another. Perhaps a least one thing could be noted as a ubiquitous feature of festivals: the ability to move at will. You’re not confined to a specific seat, and rarely to a specific building. Due to the fact that festivals involve multiple often simultaneous events and/or performances, usually stretched out over generous quite amounts of time and space, there is scope for attendees to have a great deal of agency in their experiences. For her part, O’Grady describes festivals as ‘as open space where anything might happen’. It is this feature that allows festivals to so effective absorb the structure of relational performance that O’Grady investigates. For this body of research, she created two works collaborative works that operate in contrasting modes—one fixed to a location, and one freely moving—illustrating the varied forms relational performance can adopt. The first piece she looks at is The Heavenly Court of Madame Fantaisiste (2010–2011). 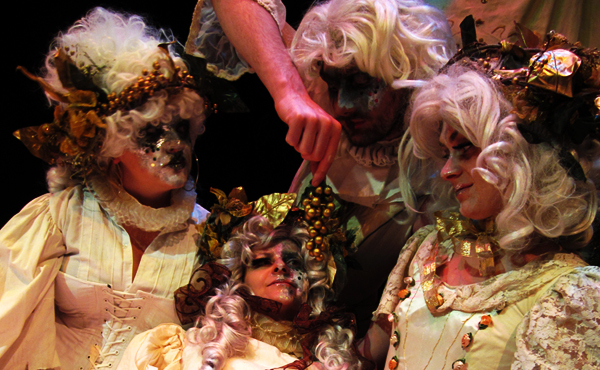 Done in conjunction with Urban Angels Circus, “The intention here,” O’Grady describes, “was to create a highly decorative, physical environment that would sit within the festival grounds.” Four actors in extravagant costume inhabit a Versailles-inspired set, under the auspices of being courtiers searching for Madame Fantaisiste. Festival goers are welcomed in, and are entertained and fed dainty delicacies whilst being gently interrogated as to whether or not they may in fact be Madame Fantaisiste. The second piece called simply Tea Party, and was developed by her company …floorSpace… It features a small collective of actors dressed as 1930s aristocrats who, while following pre-determined characters and a degree of pre-established narrative, drift through the festival looking for the right spot to picnic, at which point they proceed to enjoy cucumber sandwiches, tea, and the like. Similar to The Heavenly Court, attendees are welcomed into the the picnic and the narrative, and are free to improvise and to develop it. It situates itself as an expression of resistance against rehearsed, fixed and fixing hegemonic discourses of practice. An ethic of radical openness chimes with related work on democracy (Laclau and Mouffe 1985), the marginal politics of bell hooks (1991) and the destabilization of identity (Deleuze and Guattari 1988). These discourses insist on a genuine open future and conceive of space as a process in which we all have our part to play. In order to help conceptualise the dynamics at work, she utilises a geometric idea which she calls the ‘porous spheroid’. A spheroid is “similar to a sphere but it can be elongated, like a rugby ball (prolate) or flattened like a Frisbee (oblate) depending on the rotation of its ellipse.” The term highlights the elasticity, the mobility, and the openness of the practice, useful for it’s lack of edges and ability to ‘roll’ through space. When a group of actors tightens up, both physically and with respect to narrative direction or control, they become ‘prolate’. When the expand to allow more people into the space of the social-theatrical narrative (with Tea Party this at times extended as far as the actors leaving the picnic entirely to the participants) they are more ‘oblate’. It highlights the ever-present tension between openness and closure in any human encounter and utilizes that tension as a fundamental dynamic for managing the ebb and flow of participation and investment in interpersonal exchange. It can be used not only as a tool for developing interactive performance but also as a way of understanding other social–cultural processes where power sharing, negotiated learning and dialogue are critical to the project of radical openness. Alice O’Grady is Associate Professor in Applied Performance at the School of Performance and Cultural Industries at the University of Leeds. With a background in education her expertise lies in using performance as a means of promoting social agency and engagement. Her research interests are concerned with participation, play and performance especially within the contexts of popular music festivals and underground club culture. As a practitioner-researcher she makes interactive performance pieces that are context and site specific and that aim to facilitate embodied participation. Recently she has published work on the spatial dynamics of play within the psytrance scene for Dancecult: Journal of Electronic Dance Music Culture and also examined play as a collaborative training tool for practitioners of parkour in Theatre Dance and Performer Training. Studies in Theatre and Performance is a peer-reviewed journal which fosters a progressive forum to explore the nuances of theatre practice. The journal provides a critical scope to include other related disciplines in its scrutiny of the stage, exploring the interplay between performance, audience and dramatic practice.